June 27, 2017 by stas | Filed under Metaphysical, Transformational. Before you are born your soul makes contracts with other souls, so that when those souls incarnate they will show up in your life in a way that you requested of them. And you will do the same for them. Since we learn the most when we are under stress and have problems to solve, we task a big part of those souls to be the stress-inflicting ones. And since we need breaks to heal and recover from stress, we give the remaining group of souls a task to be nice and supportive to us. So according to this theoretical model your alcoholic father, who beat the bunkers out of you, and your loving, but suffering mother, who couldn’t protect you, your amazing inspiring school teacher and your evil neighbor next door, were all there doing the amazing and horrible things to you, because you asked them to, because you knew what stress you needed to have in your life in order for your soul to grow. What I did next is very simple. I decided to try to live my life for one month as if it were true. There is no way I can validate whether this theory is correct or not, but I’m happy to adopt anything into my way of life if it provides a consistent, sustainable and independent way of being. When I encountered this theory put forth by Caroline Myss, I suffered a lot, mostly because, well, I made myself suffer. Every time time anybody pushed any of my, many at that time, buttons I’d spend days spinning wheels in my head, feeling a victim and contemplating how I could get back at the perpetrator of my peace. I could easily do it for days, at times burning myself out from incessant wheel spinning, which wasn’t really leading me anywhere anyway. And usually either I’d get bored with the specific drama, or some new drama would overpower the old one… and I didn’t know how to put an end to it. So this theory came to me at a perfect timing. Being an engineer I put it to test right away. The next time I got triggered by someone I first internally thanked them for triggering me, because if they were working for me, how can I not thank them. This small change had a huge impact, as it immediately and completely killed the victim mentality, I so cherished and rejoiced from for so long. I couldn’t blame them for how I felt anymore, if I were the one who asked them to do this for me. Now I had an insane amount of energy and time freed up to actually go and look at the feeling and attempt to resolve it. This quickly led me to a new understanding that usually people can’t trigger us, unless we already carry a pile of unresolved conflict in the same aspect of life. The fact that someone can trigger us simply shines light to the dark corners of our psyche, that we never really want to look at. At the same time I happened to listen to a talk on forgiveness by Wayne Dyer, where he spoke of how he was a renowned spiritual teacher for decades, when he realized that he never forgave his father for dumping his family when he was just a toddler. And how he did that by going to his burial site, forgiving him there and how amazing of an impact this event had on his life. Well, I was inspired – so I decided that I can do that too. My first attempts at forgiveness were very difficult, as there were some very evil people, who did very evil things to me when I was a child and, boy, was I carrying a memory of them in my mind. But little by little bygones became bygones and I was able to forgive them. Forgiving myself for allowing those things to happen to me was another huge discovery. So now I had two tools to my toolkit – when someone triggered me I thanked them and forgave them and myself, while looking deep into the things that have been hiding under the proverbial carpet for so long. 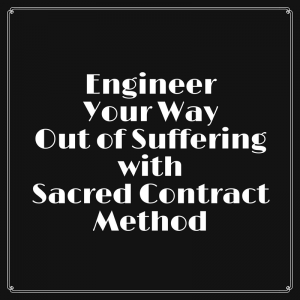 That one-month experiment had such a tremendous impact on the quality of my life, that I decided to adopt* the theory of sacred contracts as Truth. I don’t care whether it’s true or not, what I care is how it impacts my life. footnote *: For another example of choosing something that you can’t verify using just logic read on Pascal’s Wager. 10+ year since I have dealt with a huge numbers of unresolved issues, and I now have very few buttons that can still be pushed, and I’m now happy when someone triggers me, since I get a chance to lighten up even more. Of course. I don’t always remember that way and fall back into the old ways at times, but usually I recover pretty quickly, since my internal self-BS detector goes off pretty quickly. Another interesting impact this mindset had on my life is that I stopped worrying about how I show up in other people’s lives. I realized that the only disservice I can do is that if I try to decide on behalf of another person whether I should or should not do or say something to them, rather than be in the flow and just be me. That doesn’t mean that I go and carelessly inflict pain on other people. It means that I don’t worry about being me, and letting others do what they will with it. I can only be responsible for myself and if everybody were to do the same for themselves what a world we would be living in. It is mind boggling how simple and powerful this mindset is. This major change in my life also lead me to start practicing radical honesty and integrity, which is a natural extension of the sacred contracts theory, since who are we lying to if we planned all this, but that’s a subject for a different article. What do you think? Are you ready to try an experiment that may dramatically transform your life? — Marianne Williamson from A Return To Love. I am very grateful to Wayne Dyer and Caroline Myss for making their wisdom available to me at the right place at the right time.